Despite the fact that I’ve been a Harlem Line rider for most of my life, I didn’t actually live in New York until two years ago (sorry regular readers, I’ve probably said that a million times). I grew up in a small farm town in Connecticut called Southbury. The place would be miserably boring, except for the fact that Interstate 84 bisects the town, making it easier to get to the more populated areas of Waterbury and Danbury. Southbury is just about equally distant from those two, with Danbury to the west and Waterbury to the east. 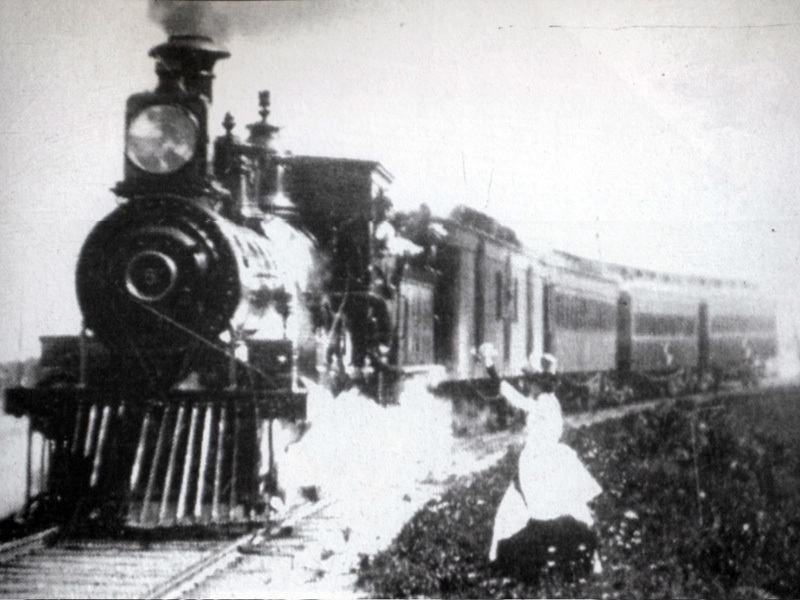 But Danbury and Waterbury branch trains were hardly as frequent and reliable as those on the Harlem Line, so we always took a ride to either Brewster or Southeast and boarded the train from there. Southbury isn’t much of a farmtown anymore, however. Many of the farms have been sold for commercial purposes. The place where I used to pick pumpkins as a child is now a strip mall, complete with grocery and office supply stores. A once-grassy hill is now home to a chain pharmacy. After the place had been constructed, a few finishing details were added to the outside of the building: one of which was the address. 14 Depot Hill. 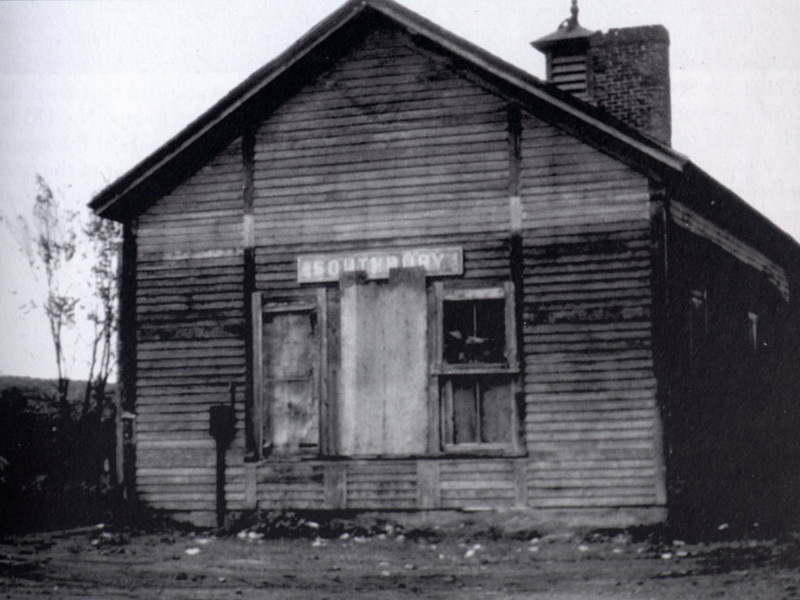 Apparently the construction workers were hardly typographers, and didn’t place the ‘p’ on the proper baseline, making it look like ‘DePot.’ It prompted an editorial in the local newspaper, reminding the town of why exactly the road was called Depot Hill – it was once the location of a long-gone railroad depot. I had known there was a railroad past in the town. In school it was briefly discussed – including the head-on collision between two trains that supposedly was the end of the railroad. After reading much on the subject of rail history, I seriously doubted this. Railroading wasn’t the safest occupation, and accidents happened frequently. I hardly believed an accident would cause the line to be shut down. 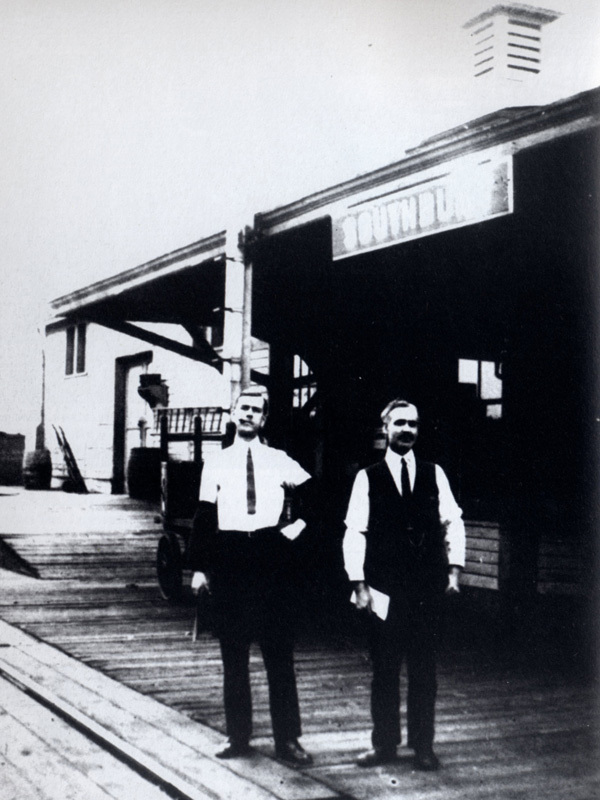 But on December 10, 1892 two trains did collide – and the engineer and conductor on one were thrown in jail for apparently forgetting they were scheduled to wait on a siding for an oncoming train to pass. It didn’t mark the end of the rail line, though. 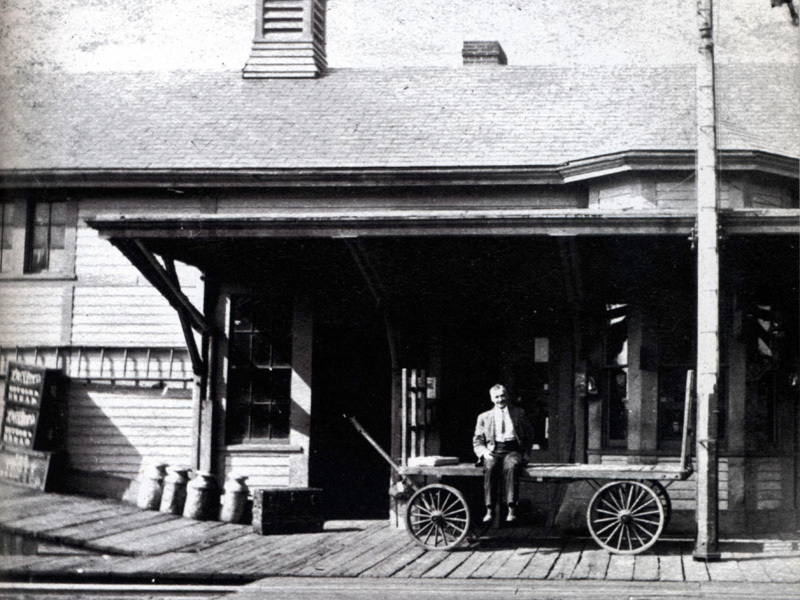 Southbury’s station was part of the New York and New England Railroad, which operated from 1849 to 1898. 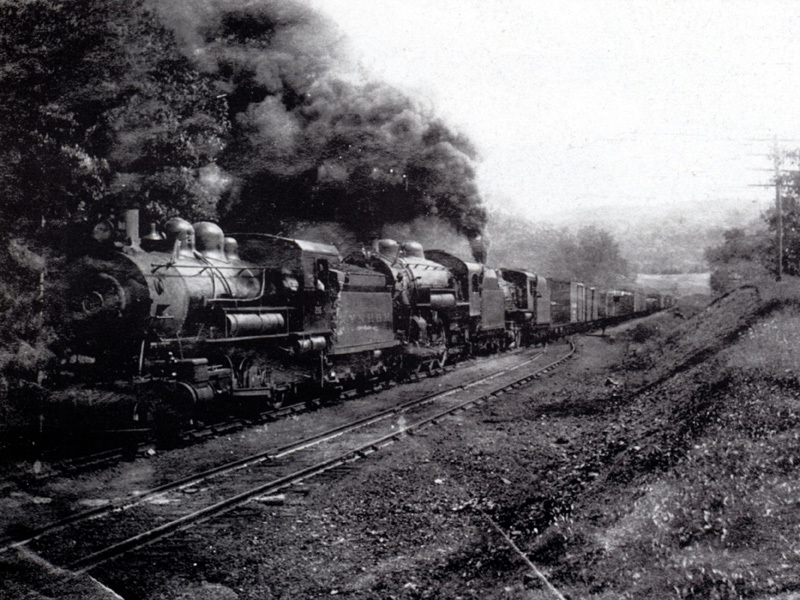 In 1898 the New York, New Haven and Hartford Railroad leased the line. 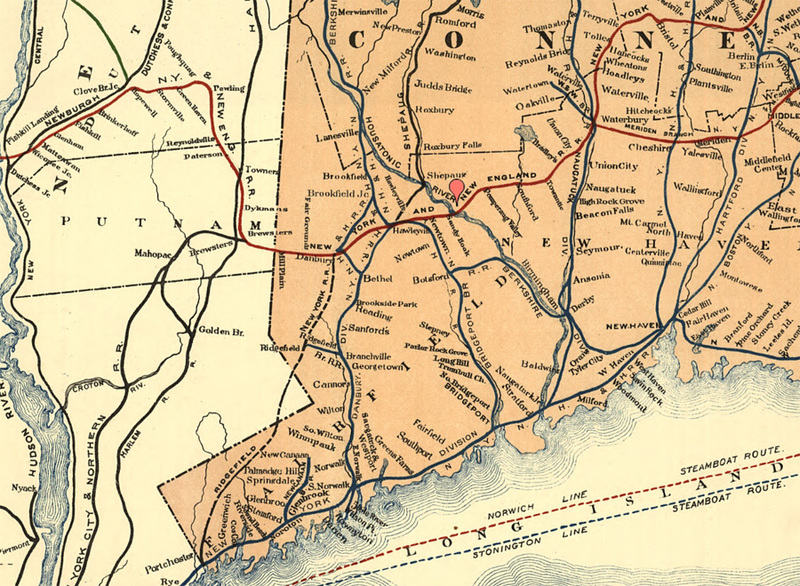 Service to Southbury continued until 1948. 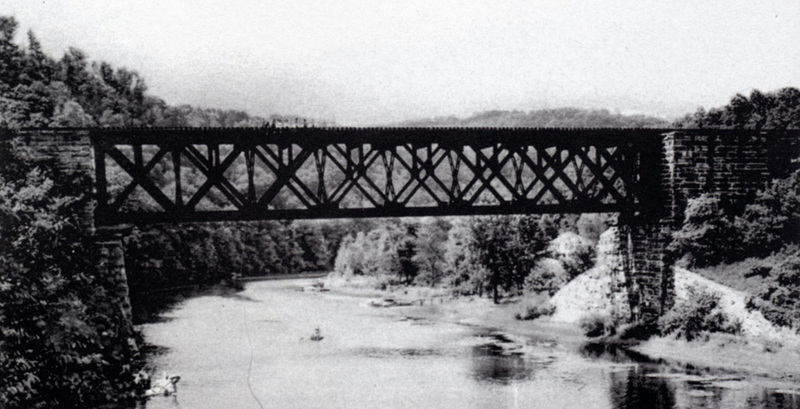 Today there is hardly any evidence that a railroad ran through the town, except for Depot Hill, and a few remaining portions of the railroad trestle bridge that spanned Lake Zoar. Some of the former rail bed has been converted into the Larkin State Bridle Trail. Below are some photos of the railroad around my old town that I found in a few books and such. Most of them aren’t the best quality. I am not 100% sure that the railroad bridge shown in the last historical picture corresponds with the remaining trestles that are there today (two bottom photos). The geography doesn’t quite match… though it is possible that the photo was taken before the Stevenson Dam was erected, which presumably altered that area, creating Lake Zoar. If anybody knows more about this, or actually has a photo that is definitely of that railroad bridge, leave me a comment! If you go to where the town beach is in Southbury and look north you will see where the bridge was in the third photo from the bottom. It doesn’t actualy cross Lake Zoar but that cove north of the beach. the last 2 color pictures don’t correspond to the black and white bridge; they are crossing lake zoar near the intersection of glen and river roads in southbury. the historical bridge is by the intersections of berkshire and river roads in southbury, not far south of the other trestles. it crosses a smaller river that feeds into lake zoar. its height is really deceptive in the picture, its gotta be between 75 and 90 feet high. 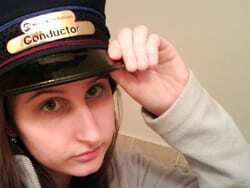 Hi there – I’ve often heard that Southbury used to have THREE different train stations at its peak. The Depot Hill (town center) one, and possibly one in South Britain and Southford as well. Lots of great info here – what are you class are you btw? I’m Class of ’97 but went to private high school after Rochambeau.. I too remember picking pumpkins as a kid before the Green was built so I imagine you’re not too far behind me. I was Pomperaug class of 2002, so a bit after you! Yep, there were also stations in South Britain and Southford. 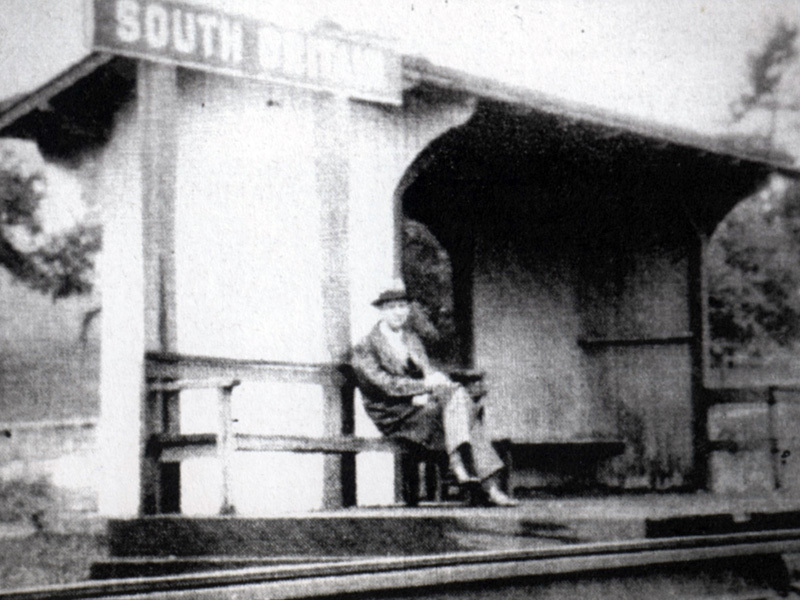 However, the South Britain station didn’t really appear to be in the area we call South Britain now. I think it was over by Russian Village/Berkshire Road vicinity. I think I have a book at home that I picked up a few months ago with some better pix/info about the Southbury stations, I’ll have to dig it up for you. That would be great.. The name of the book is fine. I’ve been on a local history buying spree lately. There was a girl with your last name in my class year, Deanna (sp?). Guessing you might be related.. Ahh, small towns. Will check back to see if you’ve located the book, otherwise you can email the info if you wish.. Thanks! Yep, that would be my effed up cousin that I haven’t talked to in years. The book is called “Country Depots in the Connecticut Hills” by Robert F. Lord. You can probably pick it up online somewhere. I can’t seem to find my copy, but it definitely has the best photos of the RR in Southbury that I’ve ever seen. 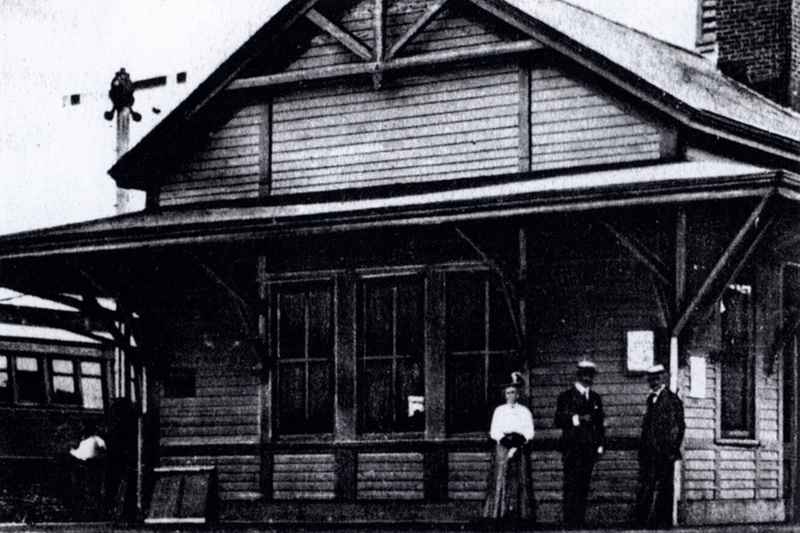 The Southford depot station was where the Bridal Trail crosses Route 188. In fact, more than 60 years after the track was lifted, the road still levels off in that spot and it is not difficult to imagine an at-grade crossing there. 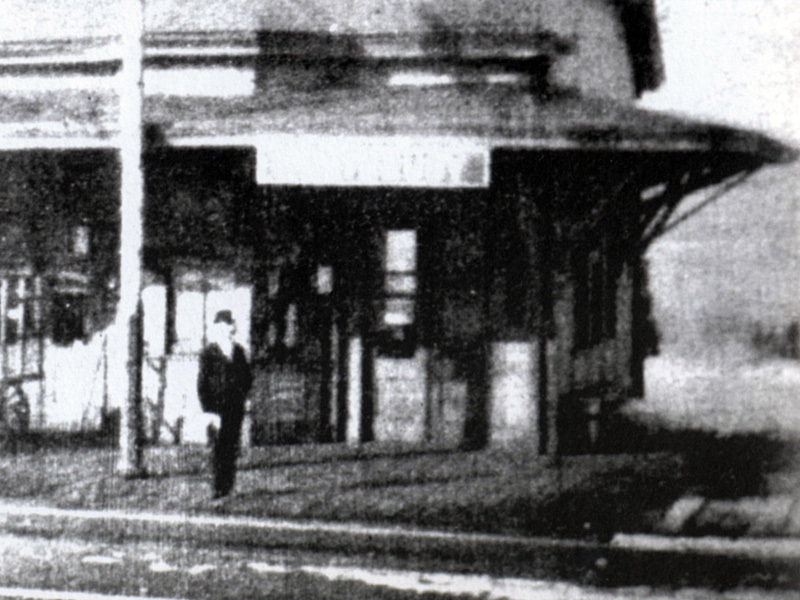 Besides the name Depot Hill, I cannot imagine there are any remnants left of Southbury’s train station. It would probably have been where I-84 current sits. The last historical bridge photo appears to be the trestle over the Pomperaug River near where it empties into Lake Zoar. It is about 1/2 mile from the surviving abutements over Zoar. The Southbury station and depot was roughly where Bullet Hill Road crosses I-84, which of course is at the end of Depot Hill Road. Based on a 1934 aerial photo, it looks like the depot had several tracks for freight loading and unloading as well as the through track, which presumably is what the station was next to. 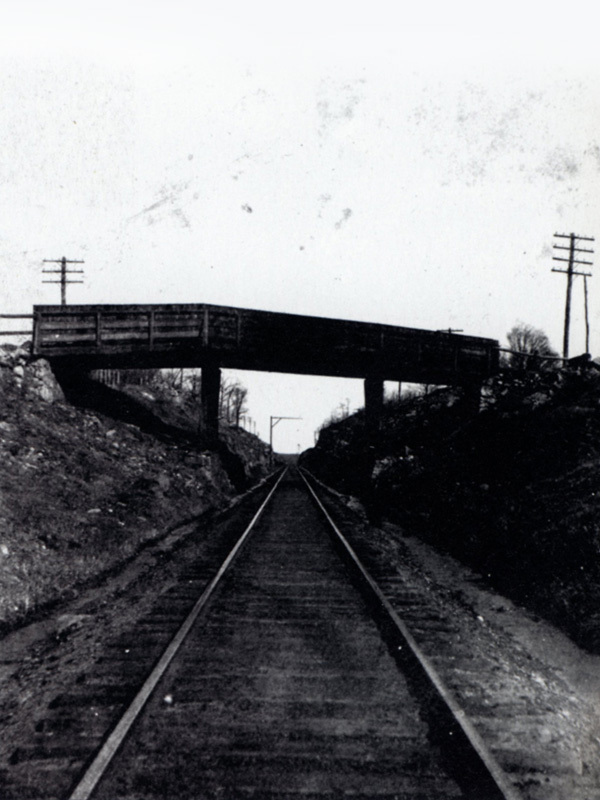 The track connected Waterbury to Hawleyville but apparently fell out of favor due to its steep grades. As well as at Southford, it is still possible to imagine at-grade crossings on Route 67 (Bridal Trail), Kettletown Road (at junction with IBM entrance) and Peter Road (just north of I-84 bridges).